Whether you wish to tackle hair problems like dandruff or excessive hair-fall or simply crave for a shampoo with a conditioner that isn’t harsh on your hair, Dabur Vatika range of ‘natural shampoos’ are just the right ones that will fulfil your needs or so they claim. Take a look. This shampoo claims to maintain the color of your raven black hair; it has ingredients like black olive and amla, that help maintain the jet-black colour of your hair. While olive oil nourishes your hair to give it lustre, amla helps retain its color. As the name suggests, this shampoo claims to strengthen your hair your hair strong from root to tip without damaging them. It has ingredients like coconut milk that helps in moisturizing and nourishing the scalp and almonds, which contain almond oil possibly helps to activate the sebaceous glands and stimulates blood circulation to the scalp to make hair strong and healthy. Presenting vatika dandruff control shampoo that does not include any harmful chemicals. With natural ingredients like Tea tree oil and lemon it supposedly helps your dandruff-prone hair. While Tea tree oil is known to prevent dandruff and help reduce dermal irritation and itch, lemon’s astringent action controls sebum flow, which prevents dandruff. For persistent dandruff problem, Vatika Anti-Dandruff Shampoo is just perfect. Dandruff Shampoo uses the natural goodness of lemon and henna, it also conditions the hair to give it body and strength while enhancing your hair’s natural beauty, without damaging or making it dry. This natural shampoo that conditions from deep within, while gently cleansing and nourishing your hair. With a perfect balance of natural ingredients like henna, green almonds and Shikakai, this shampoo is mild on your hair and leaves it soft, silky and radiant, with the gentle and caring touch of nature. I’ve used Dabur Vatika Hair Oil before and it’s good, but nothing can wean me away from good old coconut oil; I simply adore its effectiveness in keeping my hair moisturized and well looked after. 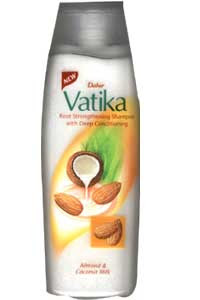 I haven’t tried any of Dabur Vatika shampoos, so can’t say for sure whether they are good enough. But if any of you have, do share your experiences. It's nice to know that there is now a sulfate-free shampoo that has suds, thanks for the heads up! Vatika Henna Cream Conditioning Shampoos is excellent. It is incredibly mild (having sodium laureth sulfate instead of sodium lauryl sulfate as the detergent), conditions hair, and smells great. Actually smells just like the Clairol Herbal Essence original version from the 70's. Is it a good idea to always use the same shampoo & conditioner? most beauty consultants advice to change the shampoo you're using after 2-3 bottles. it is not healthy to use the same brand.